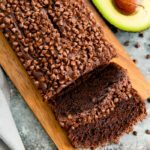 Even if you are not a huge avocado fan like me, you have nothing to fear, because this recipe is so chocolatey and the perfect texture that you wont even know it has avocados in it! Before I could take more pics of my creation…it was GONE. I mean totally demolished, this is how I can determine if my readers will LOVE one of my recipes as much as I do. 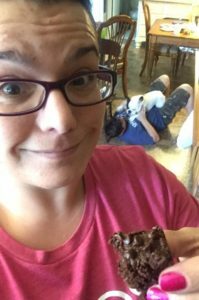 I literally had to sneak a bite while my puppy (Moe) was attacking the teenager with lots of kisses. Preheat oven to 350 degrees and line the bottom and sides of a loaf pan with parchment paper. This will make it easier to remove loaf from pan and easier clean up too! *if you decide to make muffin instead, either use a silicone muffin tin or liners. If you do not have these on hand, use paper liners but expect they may stick a bit on bottom hen removing from paper liner. 2. 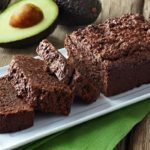 Add avocado to food processor or high powered blender, pulse to break down. Add coconut oil, vanilla or almond extract, coconut cream from can, honey or maple syrup, eggs and pulse until creamy & smooth. 3. Add chopped pecans, almond meal/flour, baking soda, salt, cocoa powder and 1/2 C chocolate chips to large bowl, mix. 4. 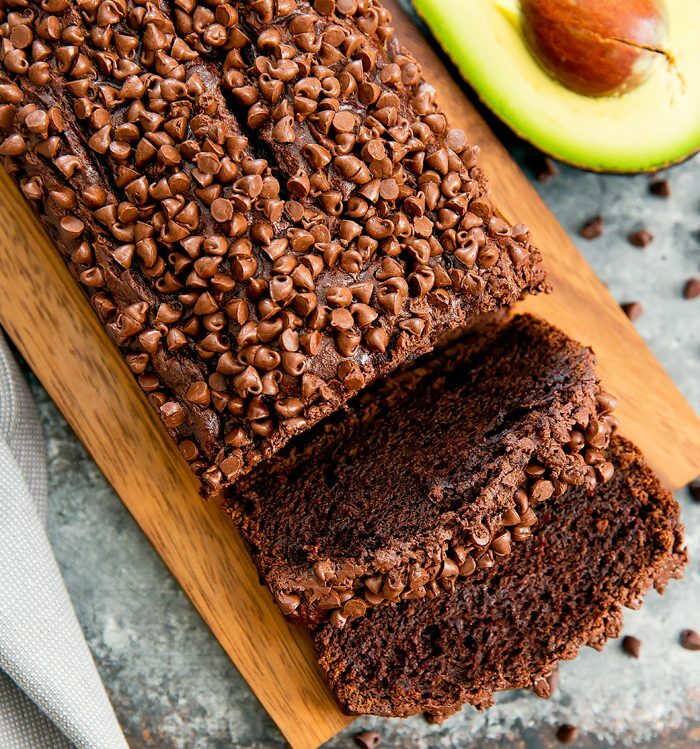 Using a spatula, gentle fold the avocado mix into the dry ingredients making sure to not over mix. 5. Spoon batter into loaf pan or tins. *Note: batter will be thick and paste like requiring you to spread the batter into the pan/tins, this is normal! 6. Sprinkle remaining chocolate chips on top. 7. Bake until toothpick inserted into the center comes out clean, about 40-45 minutes of baking time. 8. Let the bread cool (if you can lol) for about 10 minutes, then slice and enjoy! *Bread will stay fresh when stored in airtight container in fridge…..although I have a feeling it won’t last long, it never does in my house!